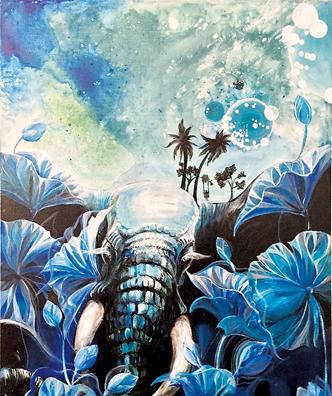 An innovatively thought provoking exhibition of paintings with an alluring touch of blue tinged fantasy, opened at RV8Y STVDIO GVLL3RY, Ward Place Colombo, last week. Refreshingly different, the paintings by young artist Geshany Balder, is much a journey of discovery as it is stepping into a different dimension. 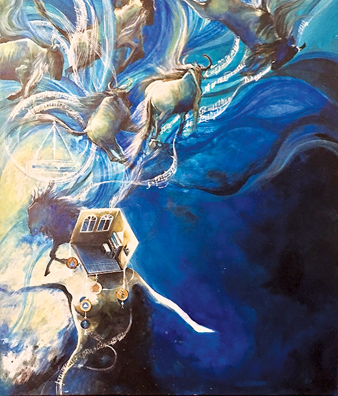 Explaining the idea behind her paintings, the young and vibrant Geshany says she uses art as a means of self-discovery and sees each canvas (that she has custom-made herself) as an opportunity to express the fantasy-based imagery that fuels her imagination. Her paintings bring together different moods and feelings, in shapes, forms and the trade mark blue, that are both near surreal and stark in their clarity. Easily deciphered by the discerning viewer, Geshany’s paintings are an invitation to a private journey through the mind’s eye of the artist. This is Geshany’s second exhibition. On display are ten of her paintings completed during the course of the past 12 months. Geshany with her family roots in Germany has studied art in both Europe and Asia. Though young she has taken the bold step of becoming a full-time artist, committed to creating imagery that evokes new discovery both of herself and for her viewer. 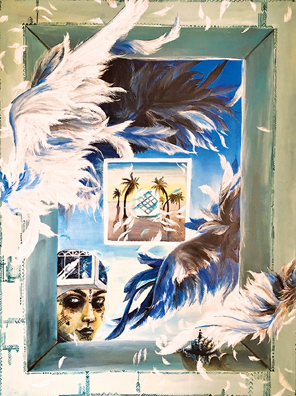 As Geshany explains, the paintings that are on display are based heavily on neo-surrealism, an art form that has grown immensely in popularity due to the rise of digital graphic art. Taking it a step further, she adds her own creatures, synonymous with those found in Greek mythology and Hinduism, weaving them between organic elements and patterns. The themes of Geshany’s art stem from the natural intrigue about the unknown: both interstellar and inter-dimensional. After the initial immersion into the details of each fantasy-based composition, one may find oneself pondering what these beings are thinking as they look on from the other side of the canvas.